Market Street is the former heavy rail corridor in Newcastle, New South Wales. Street + Garden worked closely with JMD Design to develop a comprehensive suite of furniture that incorporated full custom designed elements and customised catalogue products. The designs and pre-cast concrete hob wall elements were combined to create a seamless solution that integrates the furniture elements with the surrounding landscape. Street + Garden was asked to develop a solution that interpreted the site’s former use by representing coal train geometry and typography throughout the site. Being a rail corridor the site is long and linear and the design of the furniture elements play on this by using long linear bench seats and tables throughout the site. Market Street is set against the stunning display of heritage buildings of the main street of Newcastle and the adjacent Hunter River. This has created a new heart to the city that showcases all that Newcastle has to offer. 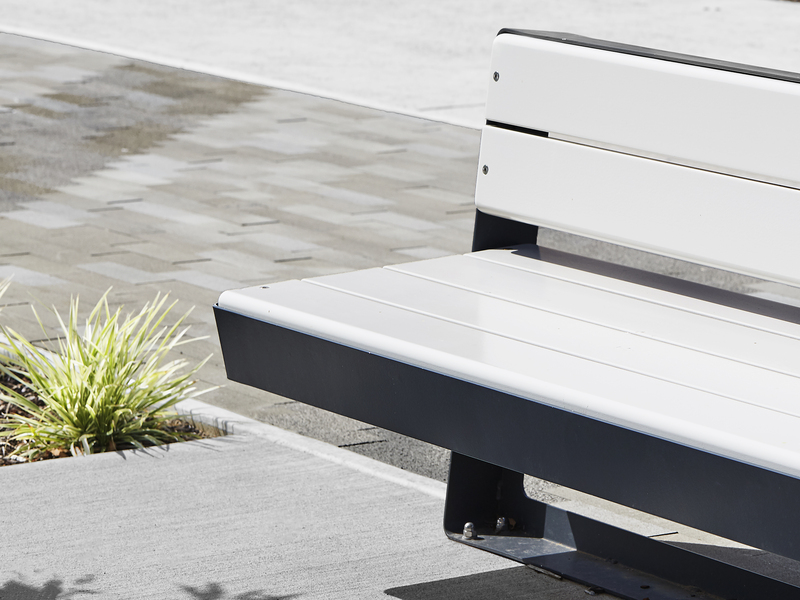 The furniture elements developed for JMD Design and installed in the landscape create a unique solution that enhances the public space for all users.